The tower quickly checked with Pan American Airways operations. 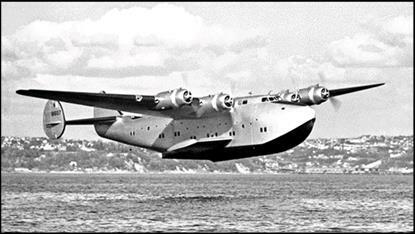 There was no flight plan for a Pan Am flying boat to arrive at that time—certainly not one from as far away as New Zealand. World War II had begun for America a month before. Was this a joke? Could it be a German crew flying an American plane? Weather reports were being coded—might this be a coded message that the control tower couldn’t decipher? Since it was still dark, no one could spot the plane from the airport. Seaplane night landings were forbidden in Bowery Bay, so the Pacific Clipper was instructed to circle and wait for sunrise. While Capt. Robert Ford orbited the New York area, Pan Am officials and military personnel were alerted and rushed to LaGuardia’s Marine Air Terminal building. The giant Boeing B-314 landed a little after 7 a.m., completing the longest continuous—and most unusual—flight of a commercial aircraft during the early days of American involvement in WWII. More significant at the time, it was the first vessel of any kind to reach the United States from the Pacific war zone. December 1941, attack by Japanese naval air forces on Pearl Harbor. The landing at New York marked the end of a nearly complete round-the-world flight of more than 31,500 miles. It was neither. Capt. Ford reached in his flight bag for the sealed emergency orders that all Pan Am captains had begun carrying when the political situation started to deteriorate in the Far East. He immediately briefed the crew that the airline would now be operating on a wartime basis and they would continue to Auckland, New Zealand. The Pacific Clipper was one of three Pan Am Clippers airborne over the Pacific at the time of the attack. Another B-314, the Anzac Clipper, with Capt. H. Lanier Turner in command, was flying with a crew of 10 and 17 passengers from San Francisco to Hawaii, the first leg of a 14-day round trip to Singapore, and was within about 40 minutes of a scheduled landing at Pearl Harbor that morning. It had been an uneventful flight of about 15 hours when Radio Officer W.H. Bell informed Turner about the bombing and confirmed the attackers were Japanese. A landing there was now out of the question. Turner immediately pulled out his sealed envelope. The instructions were clear: Get the aircraft to a safe harbor as quickly as possible, offload the passengers and camouflage the aircraft. Turner decided to land at Hilo on the Big Island of Hawaii, which had a protected harbor and was farthest from Pearl Harbor. Turner quickly briefed the passengers on the news. Once he landed and told the passengers they could go to local hotels, he announced that he was going to refuel and return as soon as possible to San Francisco. Not a single passenger wanted to make the return flight; all decided to take their chances and make their way to Honolulu any way they could. After the plane was refueled, Turner and crew took off that night and flew the Anzac Clipper the 2,400 miles back to Pan Am’s base on Treasure Island at San Francisco.